The TFA entered into force on 22 February 2017. Since its launch in June 2014, the Mercator Programme has been the WCO’s strategic initiative aimed at assisting governments worldwide in implementing the TFA in a uniform manner by applying WCO instruments and tools, as the TFA’s provisions relate, to a large extent, to Customs procedures. During the 2017/2018 financial year, many TFA-related missions have been carried out by the WCO. Many of them consisted of providing countries with the capacity to undertake a Time Release Study (TRS): the Bahamas, Bangladesh, Belize, Burkina Faso, Burundi, Jamaica, Kenya, Malawi, Maldives, Myanmar, Nicaragua, Nigeria, Sudan, Togo, Ukraine, Vanuatu and Zimbabwe. Assistance in drafting a national TRS report was also provided to Burundi, Cameroon and Chile. delivered a national Workshop on Non-intrusive Inspection (NII) Technologies in Guatemala. Details on activities undertaken in other areas, such as authorized economic operator (AEO) programmes, transit and the Single Window, appear later in this article. Besides national focused assistance, the WCO held two meetings of the WCO Working Group on the TFA (TFAWG) with various technical topics being discussed, such as the importance of coordinated border management, public-private sector dialogue, and enhanced coordination with other governmental agencies, such as sanitary authorities, for the purposes of TFA implementation as well as the coordination of priorities relating to technical assistance and capacity building. The 2018 edition augments the objectives of the SAFE Framework with respect to strengthening cooperation between and among Customs administrations, for example through exchange of information, mutual recognition of controls, mutual recognition of AEOs, and mutual administrative assistance. In addition, the 2018 edition calls for enhanced Customs cooperation with government agencies entrusted with regulatory authority over certain goods (e.g., weapons, hazardous materials, etc.) and passengers, as well as with entities responsible for postal issues. A comprehensive list of AEO benefits with certain minimum assured benefits has also been added. In order to assist WCO Members in gaining a clearer understanding of the similarities and differences between the WCO SAFE AEO Programme and Article 7.7 of the WTO TFA Authorized Operator Scheme, the WCO developed a document in the form of ‘Frequently Asked Questions’ (FAQ) that clarified some concepts while providing practical guidance to better align the obligations stipulated under both initiatives. The WCO also supported the implementation of AEO programmes in Azerbaijan, El Salvador, Iran, Nigeria, Paraguay, Papua New Guinea, Samoa, Sri Lanka and Tonga, and provided assistance to Panama and the Former Yugoslav Republic of Macedonia as well as the East African Community (EAC) on how to enhance their AEO validation process. A practical Workshop on Mutual Recognition Arrangements/Agreements (MRAs), focusing on their preparation as well as the skills necessary to negotiate them, was organized for countries in the WCO Americas and the Caribbean region as well as for the EAC. Another workshop on AEOs and MRAs gathered countries from the WCO Asia/Pacific region. A standardized and globally unique TIN format and associated guidelines and recommendation have been developed. The TIN aims primarily at enabling effective implementation of MRAs by facilitating the identification of MRA partners’ AEOs, but could also be applied in the context of any cross-border exchange of an economic operator’s data for other business processes, including mutual recognition of controls and authorized operators/trusted traders as well as enforcement related issues. Regional workshops on transit were held for the WCO’s East and Southern Africa, West and Central Africa, and the Americas and the Caribbean regions, with the objective of promoting the implementation of the WCO Transit Guidelines and collecting national and regional best practices in the area of transit. Representatives from Customs administrations, industry associations, national guarantors and shippers’ councils, other private sector entities, regional economic communities (RECs) and development partners attended the workshops. By the end of the 2018/2019 financial year, all WCO regions would have benefitted from such events. Assistance was also provided to Belarus to review its existing transit procedure against WCO guidelines. Moreover, in order to enable information technology (IT) systems connectivity when it comes to transit, the WCO is planning to develop a harmonized and standardized transit dataset based on the WCO Data Model. In collaboration with the International Civil Aviation Organization (ICAO) and the International Air Transport Association (IATA), the WCO continues to develop, maintain and promote the API/PNR Guidelines, including its technical annex that contains, among other things, the API PAXLST and PNRGOV related standards. The latest work in this area includes the release of version 17.1 of the PNRGOV standards, as well as updates to the PNRGOV Principles document and the PNRGOV EDIFACT message. A survey showed that the majority of governments and air carriers implement version 11.1 of the PNRGOV EDIFACT. A version of the API PAXLST standard in XML format is still under development and will be available soon. It comes as an addition to the existing EDIFACT standard for API, which is the preferred method to transmit API data to governments. The WCO is also promoting its “Guidance for Customs administrations to use PNR/API,” which aims to provide insight on how WCO Members can effectively utilize passenger information for passenger profiling and risk assessment, and its “Guidance on How to Build an API/PNR System.” National workshops have been organized in Armenia and Colombia with the aim of providing these countries with know-how on the establishment of API/PNR systems. Seventy-four countries reported that their information systems conform to the WCO DM, and around 55 countries have active DM implementation projects underway. Version 3.7.0 of the WCO DM has been released. The new version includes an enhancement of the “My Information Package (MIP)” as well as new data elements. A spreadsheet is now being used to publish the new Information Packages in place of the previous Word document, making it more convenient for users in mapping their data requirement to the DM. Regarding technical assistance, WCO experts delivered national workshops in the Bahamas, Cuba and El Salvador, and a regional workshop for the countries of the Americas and the Caribbean region. They also continued to assist IT experts from Burkina Faso, Côte d’Ivoire, Ghana, Mali, Togo and Senegal in the development of datasets and the electronic message format, based on the WCO DM, as they relate to the transit process, as part of a project to enable the interconnection of computer systems to manage transit operations. In addition, a regional workshop on the WCO Data Model was held in Lima, Peru back to back with the WCO IT Conference and Exhibition, with the objective of raising awareness as well as the sharing of experience on the implementation of the WCO DM in the region. participating in or conducting several workshops for countries of the Asia-Pacific Economic Cooperation (APEC) bloc, for members of the Organization of the Black Sea Economic Cooperation, and for countries of the West and Central, and East and Southern Africa regions. Members of the Technical Experts Group on Non-Intrusive Inspection Equipment (TEG-NII) continued to work on the development of a standard NII data format, called the Unified file format (UFF). The project is currently in Phase 2 with NII suppliers developing the core architecture of the UFF and setting up a testing infrastructure to have the Phase 2 development tested through a pilot project involving several Customs administrations. The eATA Carnet Working Group, which comprises WCO Member administrations and International Chamber of Commerce/World Chambers Federation representatives, developed a Globally Networked Customs Utility Block for the eATA, and a pilot project to test the issuance and circulation of the electronic carnet is in preparation. The WCO, under its Mercator Programme, is organizing regional workshops on Digital Customs and e-commerce for each of the WCO regions. These Workshops are aimed at improving knowledge and strengthening the capabilities of Customs administrations on issues concerning the use of modern technologies. Two workshops have been held: one for the Americas and the Caribbean region, and the other for the East and Southern Africa region. In addition, the WCO has carried out an analysis of the potential use of information and communications technology (ICT), and its possible implications for information management with respect to each article of Section I of the TFA. This analysis captures the relevant references, provides additional commentaries for some of the articles, aims at exploring strategic considerations on how Digital Customs can further support the implementation of specific TFA measures, and complements the Guidelines to Chapter 7 of the RKC, i.e. the Kyoto ICT Guidelines. The WCO is closely working with the Universal Postal Union (UPU) on a number of issues of mutual concern, which, in particular, include the implementation of advance electronic exchange of data between Posts and Customs, postal supply chain safety and security, e-commerce, and the quality of data in CN 22 and CN 23 declarations. The two organizations continued to provide support to Armenia Customs and HayPost (Armenia’s postal operator) as well as to Indonesia Customs and Indonesia Post on the implementation of the Customs Declaration System (CDS) that was developed by the UPU’s Postal Technology Centre. CDS allows customers to enter data about an item online, and enables Posts to supply Customs with advance data about a postal item. It also enables Customs to inform Posts about the action to be taken with respect to any given item. The WCO and the UPU also organized a workshop for the Caribbean countries in Guyana to strengthen existing cooperative relationships between Customs and postal operators at the national level, and improve the exchange of advance electronic information between the two entities. In addition, the WCO also participated in one of the “Operational Readiness for E-Commerce Project Workshops” organized by the UPU to discuss logistics enhancement and to examine various ways in which advance electronic exchange of information (pre-loading/pre-arrival) can be implemented between Posts and Customs by using the CDS and/or any other customized solution based on the joint WCO/UPU Customs-Post EDI messaging standards and the WCO DM. The workshop gathered officials from over 20 postal operators and three Customs administrations from the Arab World. Furthermore, the WCO and the UPU have published the 2018 edition of the joint WCO UPU Postal Customs Guide that is aimed at providing detailed information on relevant WCO and UPU instruments and tools, and lays down a common basis for dialogue and discussion between Customs and postal operators at the national level. The WCO Council adopted the “Framework of Standards on Cross-Border E-Commerce” together with a Resolution for its harmonized implementation. The Framework sets out baseline global standards on cross-border e-Commerce. It contains 15 Standards that are concise, progressive and focused on the e-commerce environment, with a view to providing pragmatic, fair and innovative solutions, whilst taking into account the diverse expectations and concerns of WCO Members and other stakeholders. Going forward, the Framework will be further enriched with technical specifications and guidelines for its expeditious and effective implementation in a harmonized manner. 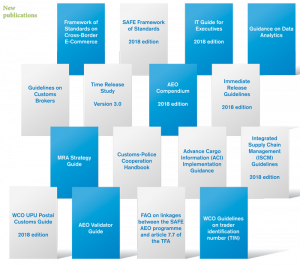 In addition, the WCO Immediate Release Guidelines were recently updated to provide specific guidance to both Customs and the trade community on expediting the release/clearance of increasing volumes of low-value and small e-commerce shipments/parcels. The WCO will be supporting its Members with the implementation of the E-Commerce Framework and its associated tools through a comprehensive capacity building programme. Five regional workshops have already been planned for the 2018/2019 financial year to promote and support the implementation of the Framework. The first event for WCO Members in the Asia/Pacific region took place from 16 to 17 July 2018. The Customs for Relief of Epidemic Diseases (C-RED) Project, which is funded by the Dutch Ministry of Foreign Affairs, has been completed. Under the Project, support was provided to Customs administrations in West Africa that were affected by the Ebola epidemic (i.e. Guinea, Liberia, Mali, Nigeria, Senegal and Sierra Leone) to better prepare them in handling future epidemic disease outbreaks and natural disasters. A review of the activities that were undertaken under the C-RED Project was published in the June 2018 edition of the WCO News magazine. The Virtual Working Group on the Future of Customs has in the last year been focusing on disruptive technologies. The April 2018 meeting of the WCO Permanent Technical Committee (PTC) devoted a whole day to this topic and strongly welcomed the development of a Study Report, the objective of which is to raise awareness within the Customs community of the latest technologies and their potential, especially the benefits and risks, as well as the pilots, lessons learned and recommendations for the future. The Study Report will be further developed during the inter-session and revisited by the PTC at its meeting in the Spring of 2019.